Have You Met "The Meows" Yet? I Can Haz More Fuud? This Dog is a Pool Shark! 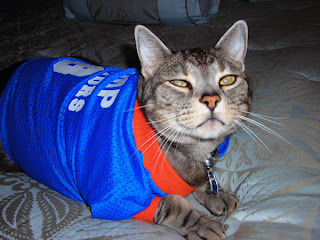 Two Cats Tuesday: Can Kitties Play Football? 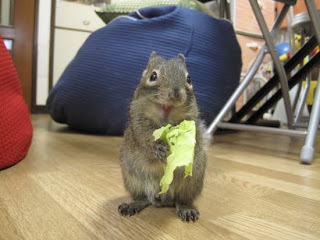 Note from Cute: Whoo hoo! 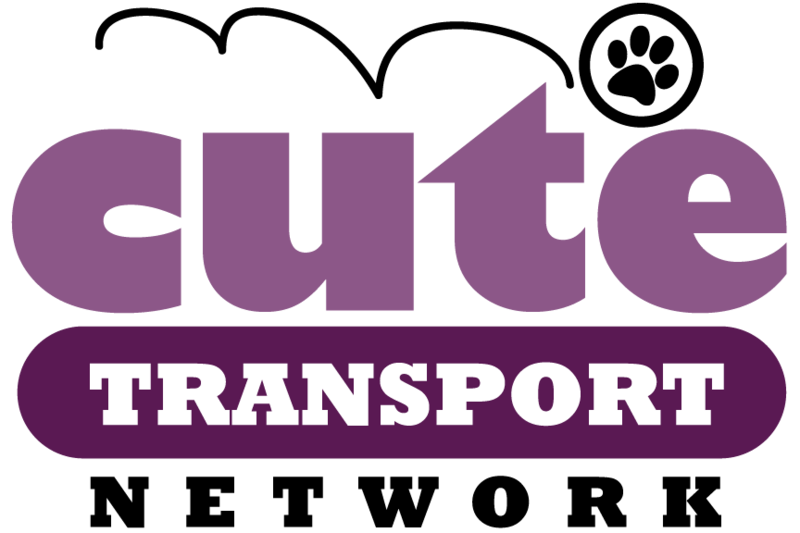 We blew past our $1,000 goal for Animal Aid donations, so we upped it to $2,000! I hope we get there! Hi Cuteheads! In honor of the #chickfest fundraiser on Twitter today, I want to introduce you to two extra-special kitties in my life. If you've been following the Cute for a while, you already know about The Meows, but today I want to share even more. Daddy Meow has always been fixed, but not so much for Little Meow. She had three litters of kittens while I've been caring for her, but until recently didn't trust me enough to let me grab her. For each of her first two litters, I was able to find and adopt out one kitten each. This is them! Pirate and Peanut. They both got happy homes. In fact, Peanuts 1st birthday is tomorrow the 12th! When Little Meow had her next litter I lucked out and had help. A great friend helped me round up the baby kitties (only 4 days old!) and momma and we got them a foster home through Animal Aid, an amazing non-profit rescue here in South Florida. 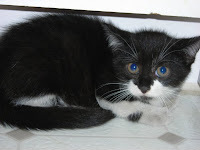 Animal Aid rallied behind Little Meow and her new babies and fully funded getting her spayed, feeding and caring for the babies and adoptions when they were old enough. I can't thank them enough. These are the babies from her "last hurrah" litter: Beanie, Yin Yang, Scruffy and Swirl (clockwise from top left). I loved Scruffy! Little Meow even ended up taking in three little orphan kitties whose mommy unfortunately died while giving birth to them. She nursed 7 babies! And after she was done being such a good mommy, Animal Aid paid to get her spayed and I was able to bring her back "home" to the parking lot... and back to Daddy. A happy ending! It's been about 6 months since then and Little Meow and Daddy are happier than ever -- with no worry of kittens or getting pregnant -- and some super cute kitties have happy and safe forever homes. All thanks to the amazing people at Animal Aid. They are just a few people who spend an incredible amount of time and love on the cats they rescue and help. I can't say enough about what a great organization Animal Aid is. This is why I'm so excited about #chickfest today -- it's a 24-hour virtual "pawpawty" (2 p.m. today to 2 p.m. Saturday) on Twitter to raise money for this extra special group. Animal Aid has a main center with a Cat Room which houses many adult cats and kittens hoping to find mommies and daddies to take them home. They also have several Cat Rooms at Petco and PetSmart locations where people can meet the cats and kittens, and hopefully fall in love with them. The whole time they are waiting for forever homes, they are loved, petted, played with and cared for. They all have names -- and everyone at Animal Aid knows them by their names. You won't find anyone named Cage #127 here. They are a truly special organization. If you have a few dollars to spare, and would like to help out Animal Aid so they can continue to do the amazing things they do, please consider donating to our drive. 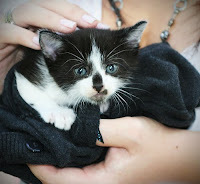 Our goal of $1,000 would go so, so far and do so much for these needy cats and kittens! Thanks for reading... I'm off to feed The Meows! P.S. 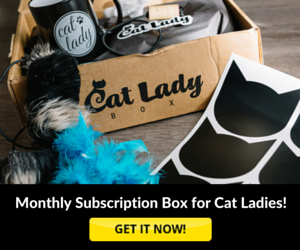 Did you know that all the ad revenue I get from the Cute goes to buying food to feed The Meows? It does! So thanks for your clicks and support. 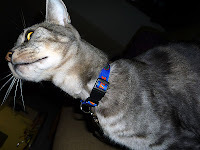 Update: I had to help Daddy Meow to the Rainbow Bridge on June 10, 2010. He was losing weight quickly, so I took him to the vet, where I found out he had cancer. There was a large tumor in his stomach, and the vet told me he was probably in pain and that it would be best for him if I let him go peacefully and comfortably. I'll never forget Daddy Meow. He was one of the best cats ever. Thank you all for letting me share him with you. Updated update: Little Meow is now an inside kitty! She got lucky and I was able to get her out of the parking lot and into the most perfect home. Now she's the princess she always deserved to be! This faucet cat knows there's not sense in doing anything halfway -- if you're going to drink from the faucet, you might as well dive on in, right? Come on in, the water's fine! Another kitten drinking water, please. *Thanks to Cute's Twitter friend @Chaoskater for passing this cute faucet cat video on! Something fishy about this rat... Can't quite put my finger on it, and neither can these Casey and Sassy. Right about halfway though, one has the best ijustdonotgetit face. According to the video info, this rat isn't even remote-controlled! You just plop in a battery and off it goes. I'm going to have to find one of these ridiculous rats for my two boys! 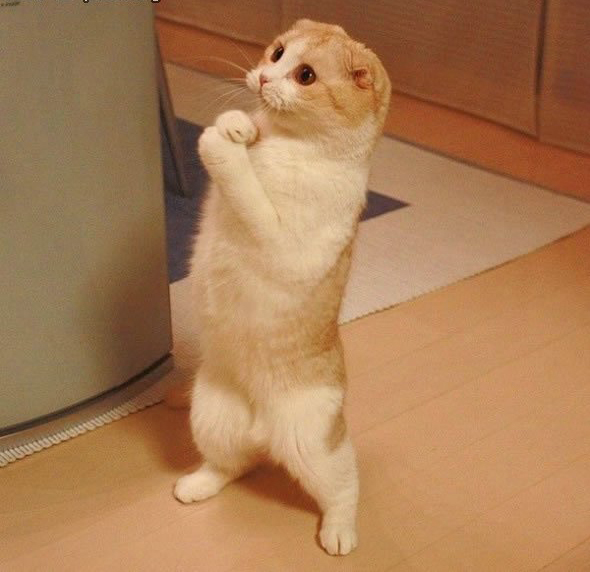 When it comes to begging kitties, I think this little guy must be The Master. Observe... and totally fall for his cuteness. OK, kitty. You win. Here's 2,743 treats. How about some raccoons begging for ice cream next, please? *Thanks to Cute's friend @Kanga_Rue for passing this cute kitten picture on! Watch out if you ever see this dog out at a bar or pool hall somewhere. Do not let his cute looks and flappy tongue fool you -- he is a pool shark, and I don't doubt that he'd easily take most of us for our money if we bet him a game of pool. How about a doggie in a pool next, please. Cute dog playing pool video spotted on Zoo Kawaii. Yay! Its Two Cats Tuesday! I love today. 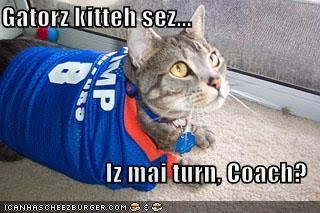 Well, Cuteheads, it's finally football season again. 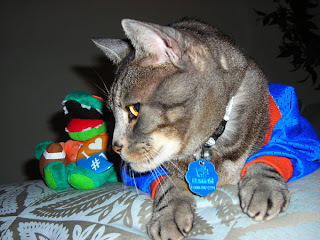 There's finally something besides baseball and golf on TV, Sundays have meaning again... and the boys get to wear their Florida Gators gear! 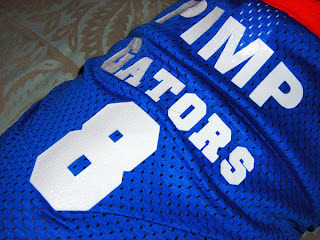 If you don't already know, I'm a HUGE Gator fan. So, by default, Pimp and Moo are, too. Pimp is actually born and raised in Gainesville, Florida -- I got him while I was up there (Long story short: He was named Pimp because we lived in an apartment with four girls and so, clearly, he was the Pimp.). 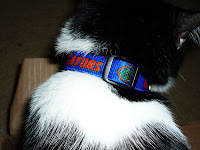 Moo decided to become a Gator as soon as he adopted me. Thanks for coming by for Two Cats Tuesday. Come back and visit Pimp and Moo against next Tuesday! Monster has a very interesting talent for a cat -- he can sing! And not just a little la, la, la singing, Monster is an opera cat. You see, Monster has a vocal cord condition that makes it so he "sings" when he yawns. What a cute condition! How about some cat yodeling next, please. 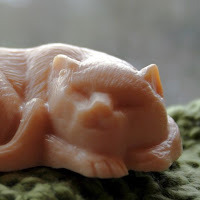 Cute Giveaway: The Cutest Little Soaps You Ever Did See! I'm so excited about this giveaway, and not just because it's so freaking cute, but because the blog behind these special soaps is one of my absolute favorites. Anyway, we're giving away three yummy goat soaps today! All you have to do is fill out the form below, and one lucky winner will get three of the cutest soaps you ever did see. You see that cow-looking goat over there on the right? That's Harry! 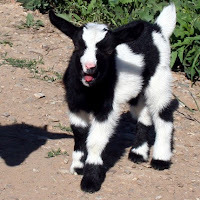 He's the baby over at the Happy Goats farm, and he's the inspiration for that cute little "CowGoat" soap down there. 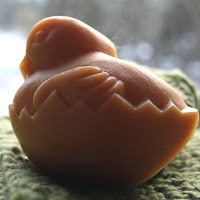 We're also giving away a cute "Cat's Got Your Goat" soap and a "The Chicks All Right With Pricilla" soap! I'll email you if you win and you can either get these three (they're my favorite, so that's why I picked them) or any three you want to pick out from the Happy Goat shop. Winner's choice! 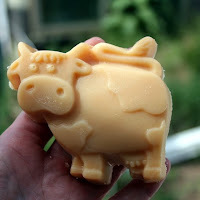 Enter to win Happy Goat Soap!